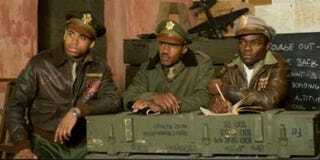 If Hollywood executives take away anything from this past weekend's opening box office numbers for Red Tails, it is this: A lot of black people went to the movies. Media outlets like Entertainment Weekly are already spinning how George Lucas' $58 million passion project, based on the true story of the African-American World War II fighter pilots known as the Tuskegee Airmen, did far better than anyone thought it would. But don't believe the hype. The campaign leading up to the release of Red Tails in 2,512 theaters nationwide was primarily the work of Lucas, the film's executive producer, who was vocal about the risks he took making the film and the challenges he faced, all because the story and its characters were African American. Lucas played the race card — he played it well — but he is also guilty of overplaying the hand with which the race card was dealt. Nobody understands the importance of supporting black film more than black people themselves. I know and bemoan the fact that Tyler Perry and Spike Lee are "all we have," but I still buy a ticket if one of their films is showing, even if I end up sneaking into another movie. I am a huge fan of Salim and Mara Brock Akil, the husband-and-wife team behind the upcoming film Sparkle. Two films I have yet to see but are one and two on my movie priority list: the Steve McQueen-directed indie film Shame and Pariah by Spike Lee protégée Dee Rees. My moviegoing habits are so militant, I'm going to see Man on a Ledge not because of the film's star, Sam Worthington, but because Anthony Mackie is in a supporting role. And doesn't Denzel also have a new movie coming out called Safe House? It looks like Training Day 2, so count me in for that, too. Here's something that may shock George Lucas: Black people love to go see movies. Black people especially like to see movies directed by one of their own, starring one of their own or telling a story about one of their own. Red Tails' $19.1 million opening-weekend receipts attest to this. But black people alone cannot be expected to change the minds of Hollywood executives who think that stories about black people or featuring black people or told by black people are niche. In order for Hollywood suits to believe that black stories, black actors and black filmmakers are important, there need to be more nonblack people buying tickets to see those movies. Do not be fooled by someone like Tyler Perry, who is the highest-paid man in entertainment, according to Forbes. Perry has had to make his money off more than just movies. His empire is self-made, much like that of another filmmaker, Lucas. And yet, with all his influence and moxie, Lucas chose to make his promotional campaign a guilt trip, telling people the reason it is important to see Red Tails is that the entire existence of black Hollywood is hinging on the success of the movie. I should know, because I was one of the people who bought a ticket and saw it this weekend, but I did not need Lucas' pandering in order to do so. In 2007 I bought a ticket to go see Stomp the Yard, a film about two rival step teams at a fictional historically black college. The film brought in $22 million during the opening weekend and opened at No. 1. If the comparison seems like a stretch, maybe a more apt one would be Spike Lee's Miracle at St. Anna, the 2008 World War II movie loosely based on the 92nd Infantry Division, an all black-unit. Opening-weekend box office: $3.5 million. I was there for that, too. Hollywood executives do not understand the universal appeal of black stories. Black stories reflect the culture of humanity, not the culture of a subgroup. Just because the cast is black or the director is black does not mean the movie is for blacks only. The man who made Star Wars and Indiana Jones, two franchises that plenty of black people have seen, should have been screaming this from atop the towering pedestal he's been put on. Red Tails did well, but its opening-weekend numbers should have been better. The fact that they are not is the fault not of black people but, rather, of everyone else who failed to see that Red Tails is about more than just black soldiers in World War II. It is an American story about World War II. More Americans should have come out to see it. Instead they went to see Underworld: Awakening, this weekend's No. 1 movie. Jozen Cummings is a writer living in Harlem, N.Y. You can follow him on Twitter and read his blog, UntilIgetmarried.com.